Whether you are starting a new business or just looking to upgrade, your choice to purchase a new point of sale system will influence almost every aspect of your day-to-day operation. Therefore, it’s vital that you ask yourself the right questions to narrow down your choices. Doing so will allow you to determine which solutions will work for your business and which ones will force you to compromise. Starting your POS search from scratch can easily leave your head spinning from all the brands, features, and options that you find advertised online. Staying focused on the questions that matter to you will help you maintain your bearings as you navigate this information on your way to the perfect POS system for your business. Is the interface simple and user-friendly? Does it help you track data and manage your business? Does it offer online ordering? You will find through your research that some systems are robust and full-featured while others simple and streamlined. 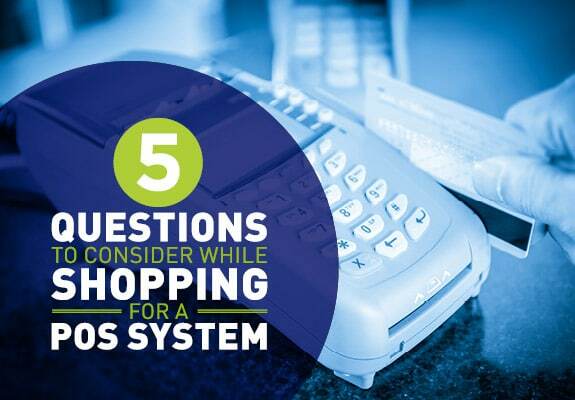 Every business has different POS needs—make sure yours are met by considering the following questions while researching your new system. 1. Is the interface simple and user-friendly? Anyone who has worked in the retail or service industries knows it can be frustrating to learn the intricacies of a new POS interface. It seems like each system has its own layout, operating system, and user interface. Having a system that is simple and easy to learn can save your business time spent training new employees. These savings could make all the difference in a competitive market, especially if your payroll tends to see heavy turnover. For instance, if you run a business such as a bar with high traffic and employee turnover, a POS system with an intuitive interface can cut down on delays caused by inexperienced servers. An intuitive interface is especially crucial for businesses that utilize customer self-ordering. These days, consumers are accustomed to a certain level of ease when making digital purchases—if your business uses self-ordering, choose a POS that will match the ease of digital purchasing in the real world. Another important aspect of a user-friendly POS is the ability to handle multiple payment methods easily and quickly. Having a system that can handle cash, chip card, normal card, and contactless payment will further minimize delays and make sure all your visitors become customers. Similarly, a system that can easily split complicated checks, offer gratuity suggestions, and allow the customer to select how they want to receive their receipt will further speed up transactions and improve table turn. Mobile POS allows your staff to walk the floor and assist customers freely or walk with them to another area of the store before making a purchase. It also allows your busy servers to handle payment right at the table, empowering a quick and easy billpay and cutting down on delays which frustrate customers and stifle table turn. Mobile POS systems are becoming the new normal for businesses such as restaurants, coffee shops, and bars that want to improve the efficiency and flexibility of their transactions. Mobile and bluetooth enabled cash drawers integrated with pos software also provide a better shopping experience. During peak traffic hours, associates with tablets can take the check out to the point of decision, cutting down on checkout queues and decreasing store walkouts. Another benefit of mobile POS systems (also known as mPOS) is that they store data on the cloud, so there’s no danger of losing a hard drive and having to start from scratch with your system configurations and customer data. This also means you can check business reports from anywhere that you’re connected to the internet. Make sure, however, that your cloud-based system has an offline mode in case of an internet problem. On the other hand, if most of your transactions occur at a single location, you may prefer the simplicity and familiarity of a conventional POS. The best mobile POS systems, however, can be mounted and integrated with your cash drawer, giving you a stationary POS with a smaller footprint than most conventional systems. Mounted mPOS systems and tablet integration systems can be easily turned around to face outward toward the customer for signatures, tips, and the input of personal data, changing an annoying and time-consuming process into one that is quick and hassle-free. This feature is becoming the norm in coffee shop POS systems because it eliminates the need for customer loyalty cards in favor of loyalty programs utilizing phone numbers or email addresses, adding convenience to the loyalty process for customers and providing your business with useful data. 3. Does it help you track data and manage your business? Speaking of data, you should consider whether your new POS system will let you create and check real-time sales reports so you can stay on top of your business. Most POS systems offer help with more than just transactions—they feature accounting, inventory tracking, scheduling, and other functionalities as well. Do you want to be able to see your store’s top selling items, or switch between individual and collective analysis of your multi-location business? Having these features integrated with your POS can streamline your whole business management process. Cash loss at the POS and the time spent manually counting cash, conducting top offs and lifts can be one of the biggest challenges faced by retailers. Internal cash theft and the cost of manual labor will eat at a retailer’s bottom line. Intelligent cash management solutions are able to feed data back to the POS and store systems group. This data can be used to send managerial alerts to improve customer service and improved business insights. Through analytics, retailers can fine-tune their cash processes to make them as efficient as possible. If it is important to you to automate the collection and analysis of data, consider choosing a POS solution that offers these features. Many systems also incorporate time clocking and shift scheduling features, so you can track employee hours in the same place you view other important data. Having these metrics in one central location with a robust POS system can prove extremely useful for managers and owners. On the other hand, you may be committed to certain aspects of your current POS or not need the level of sophisticated data management offered by some systems. Lavu offers a variety of POS systems at different price points and with different features, from basic to robust, so you can prioritize those that matter most to you. 4. Does it offer online ordering? If your business receives a large amount of pick-up orders, it’s crucial that your POS system works well with your website to facilitate online ordering. A system that sends online orders straight to the kitchen will simplify the whole process and allow cashiers and servers to focus on other tasks. You can even enable online payment, further reducing the in-store component of the transaction. If you want to know how much you are selling online versus in-store, choose a system that collects and compiles that data. Some systems also compile user data collected during the ordering process, so you can tailor promotions and offer special deals to loyal customers, programs which can be very effective in improving customer retention. Any business that incorporates online ordering will want the ordering process to be as hassle-free as possible—a slow or glitchy website will turn off customers who turn to online ordering for its speed and convenience. Look for a POS system that offers high customizability as well as high stability, so your site can accurately reflect a complex menu without requiring too many clicks to get from start to finish. It’s also essential that your website works with mobile devices, as these represent a significant portion of online food orders. One of the benefits of online ordering for your business is that it allows for the collection of user data for more effective marketing. However, collecting data comes with responsibilities, so make sure you also investigate the cybersecurity features of your new POS. If your business has ever had to deal with a data breach or other security issue, you probably realize how long they can take to resolve. Your customers expect maximum convenience as well as maximum protection—a difficult balance to strike for many POS systems. If your business deals at all with customers’ sensitive information, it is imperative that you choose a system that meets industry cybersecurity standards. For instance, security is one of the biggest reasons many people still resist cloud-based options when shopping for new devices or software. A data breach can very quickly turn away loyal customers and hurt your business. Gambling on cybersecurity by ignoring features like EMV chip reader and contactless payment integration is just not worth the risk. Look for systems that include these features as well as others such as data encryption, tokenization, and automatic updates so your system’s security never falls behind. If your POS system’s website discusses security without mentioning PCI compliance, you should definitely investigate some more into their security measures. PCI or Payment Card Industry defines baseline security standards that every system should be able to meet. The answers to many of the above questions depend somewhat on your personal preference and business needs, but security is an area where compromise can prove extremely costly. Doing your research before purchasing a new POS system for your business is an absolute necessity, but the sheer amount of available information can prove daunting for some. Ohad Jehassi is the President of Lavu. Ohad has over fifteen years of international product-centric general management and marketing experience. He has launched four start-ups and been the CEO or founder of three, leading the rapid growth of digital media, marketplace, and marketing services businesses. He is a business mentor with Endeavor and serves on the executive committee of the New World Symphony.